← Where next for open data? I’ve just been invited to participate in LB Hackney’s Scrutiny Review of Transparency early next year. My first engagement for 2012 to date! So what is, or what could be, the role of local authority’s Overview & Scrutiny Panels in promoting transparency and publication and use of Open Data? I’ve long thought that Overview and Scrutiny Panels are a really important part of local democracy, although they’re often not exactly the most riveting things in the world. In the Executive system, which has a Cabinet of councillors leading on specific themes, ‘backbench’ councillors have a critical role in holding cabinet to account. The Scrutiny panel is one way this can happen. Its role is to review performance and examine the decisions of the Executive from a non party-political perspective, and to conduct in–depth investigations into key issues for their area. They usually do a few planned investigations and, importantly, usually have the flexibility to respond to issues and concerns of local people. I had the opportunity to take part in a Scrutiny panel hearing in Gateshead in 2009 on the role of the third sector in public service delivery. Actually a really enjoyable experience and a very impressive bunch of officers and committed members. Co-provision of the Scrutiny role with citizens? With transparency a fundamental part of how Government hopes to deliver choice and accountability in local public services, how could local authorities go further in gathering views from local people? And in collectively holding the Executive to account? Many Scrutiny committees take evidence from ‘experts’ and go on information gathering visits locally, but how could Open Data add to this? Could much more information be published, but in a much shorter and more accessible format to help start conversations and support evidence gathering? 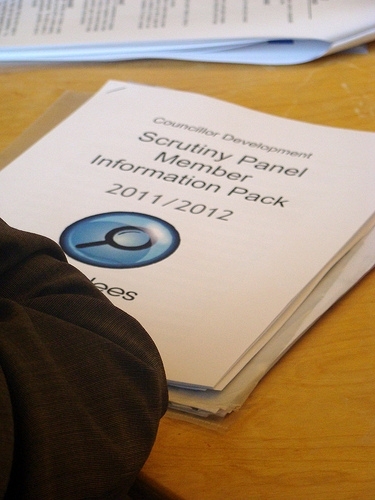 Could Open Data make the role of the Scrutiny panel more effective? While we assume that Scrutiny panels have access to all internal information about service provision and analysis of impact, we could ask whether this is the fullest picture available? How could Open Data published by other service providing organisations feed in, and how can this happen as a matter of course? What about contextual information and softer intelligence, especially about emerging needs or newer communities? Could Scrutiny panels make their work more accessible and interesting to a wider range of people using Open Data? By which I do not mean simply publishing a swathe of spreadsheets, although publishing raw data is important, but thinking about how communities might want to access and use this information. What data visualisations would help communities understand the tough issues that councils are grappling with? What works with different communities? What are the key pieces of information that really engage people? The killer facts? Transparency is not just about publishing information. We all know that our local authorities publish detail of their plans coming up and minutes of meetings, but who *really* examines these? And Open Data is not just about getting raw data out there. After all, most of us don’t have the skills to make any use of it. It’d be really interesting to test some of this out. What key issues are the Scrutiny Panel looking at that people care about? Schools? Leisure? Environment? Equalities? How about we publish open data stats on these themes in accessible visual formats? The comparative cost of various service delivery options in accessible visual format, either retrospectively or as part of a consultation? Publish what data you have about impact and outcomes in accessible visual formats? I’d be really interested in examples of where this kind of thing is happening already, or where authorities like Hackney are explicitly using Scrutiny functions to drive transparency. Originally posted over at DataBridge.